The Reverend Gyles Ponsenby-Smyth is delighted to announce that St Hilary's Church is to have a new extension built to accommodate a new chancel and sanctuary. He knows that they will need to raise some money though for it to be built so he has arranged a coffee morning to help raise the funds. 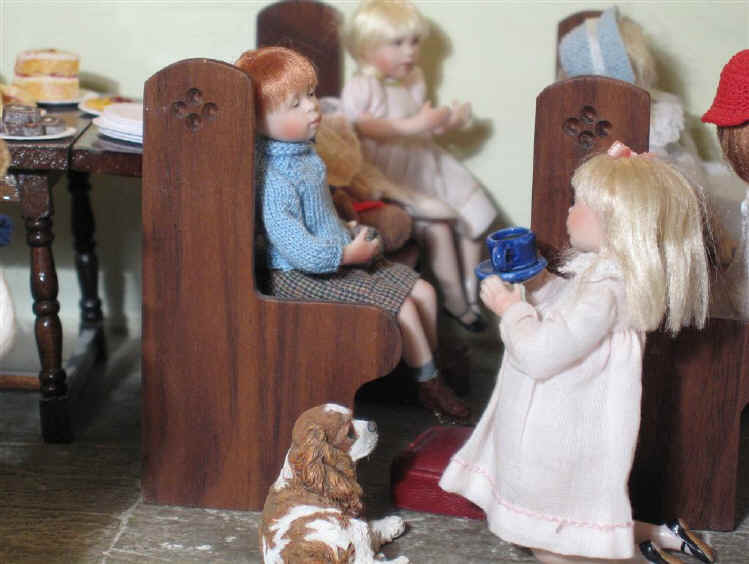 The vicar has asked the children to help with the coffee morning. See how well they did below! 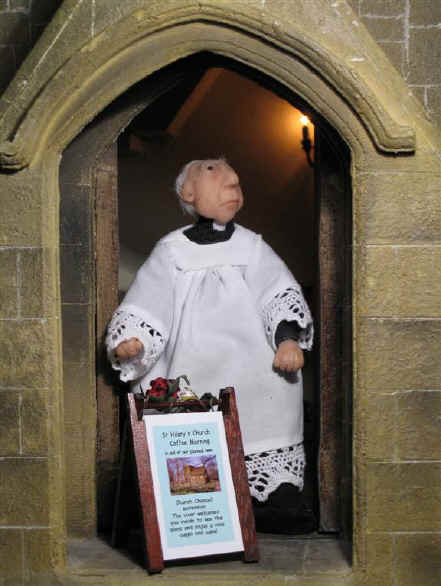 Here is the vicar at the doorway of the church. He has made a special notice to advertise and entice visitors as well as congregation members into church to support the event. Alice, Tom and Megan are the first to arrive at church. You all can see how well they have all done arranging all of the cups and saucers, teapot and cakes on this new tea trolley. 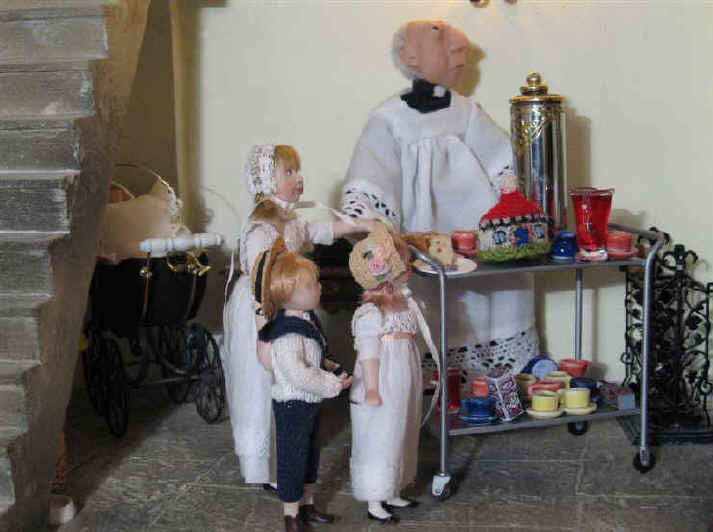 The tea trolley has been bought for the church to use for these kind of special occasions. They are going to also use this lovely tea trolley when they have coffee and biscuits in the church after the family Sunday morning service. 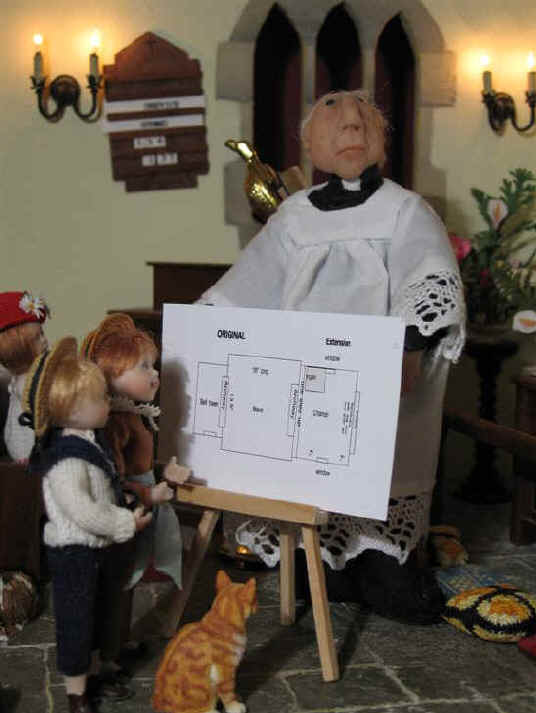 The vicar has printed out the plans for the extension to St Hilary's. This shows everyone what the church will look like with a brand new chancel which will house choir stalls and a new sanctuary. Tom and Ben come up to inspect the plans for themselves and think they are great! Priscilla Jane is a very prayerful child. 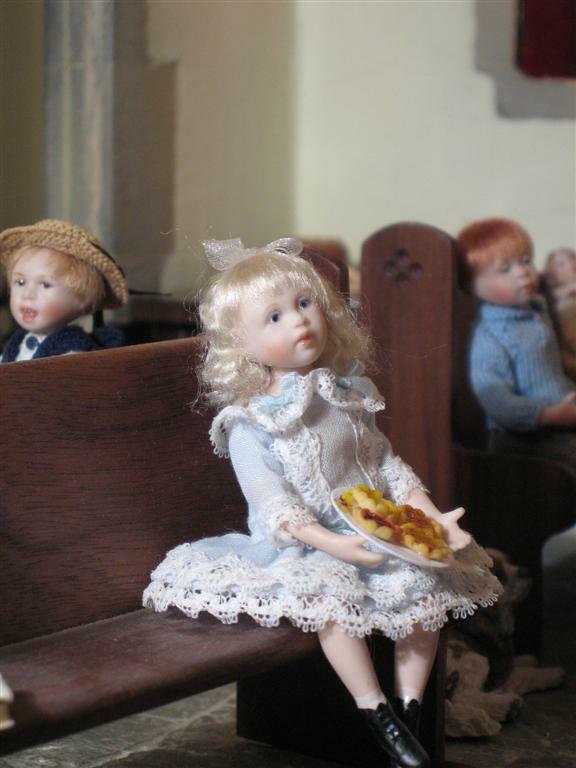 She immediately decided to pray at the altar rail. 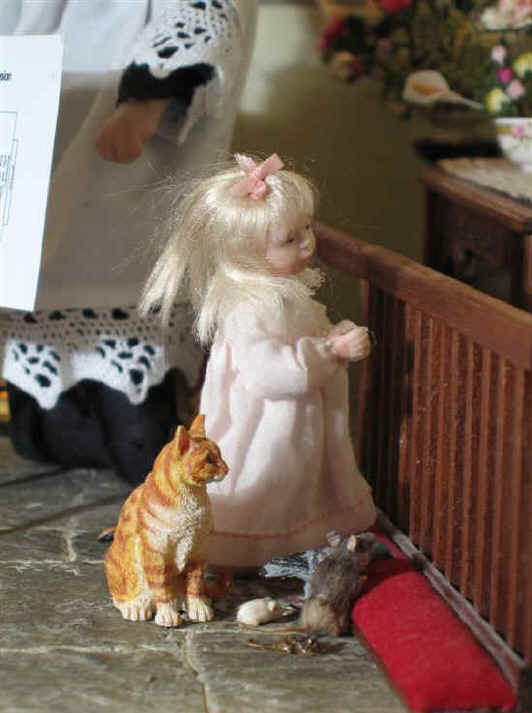 She prayed that they would be successful in raising a lot of money to pay for the new extension work. Can you see that even Sepp the rat and Syd the pigeon are praying too! Of course the pet birds and animals think that a new chancel and sanctuary will give them more new places to play in and hide! 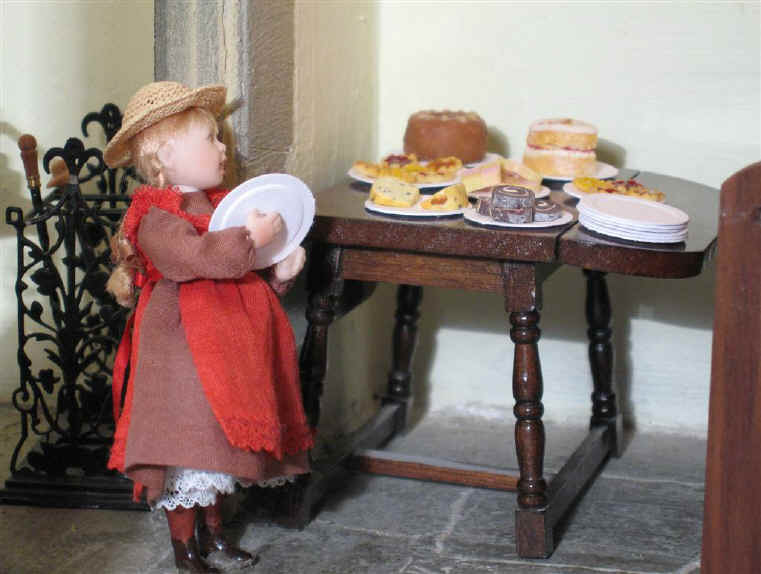 Adele is the first to check out the table which has got lots and lots of cakes on. Which cake should she choose - she really can NOT decide! Tom is helping by giving out cups of tea and coffee. Oh dear, Amelia is always enjoying reading a book or two. We hope she looks up soon and notices that Tom has brought her a cup of tea! Priscilla Jane is offering a cup of coffee to Robert Alexander. However, like Amelia, he seems to be lost in a world of his own and not at all interested. He is worried because he has lost his football and hopes he finds it when he gets home. Georgie, Robert Alexander's pet dog, however is most interested in that lovely cup of coffee! Perhaps Priscilla Jane should let Georgie have the cup of coffee instead? 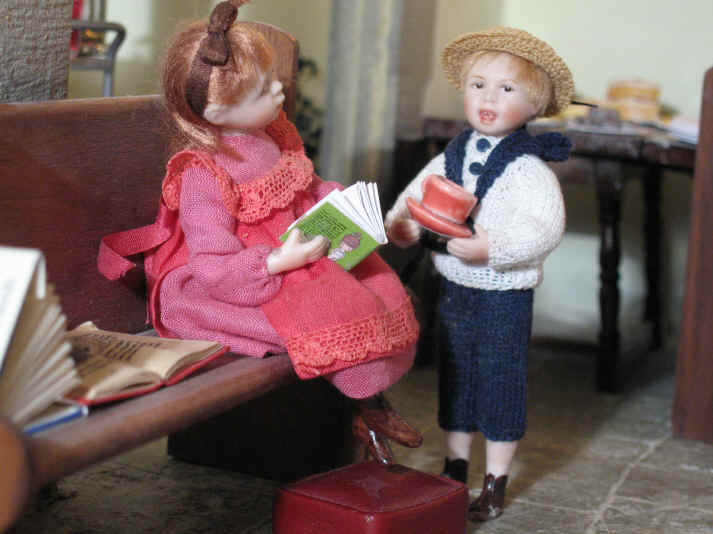 If she DID give it to Georgie though we think the vicar would NOT be pleased would he? Emily has picked four jam tarts! If you look closely you can see that she is a very messy eater and some of the jam is smeared on to the paper plate! 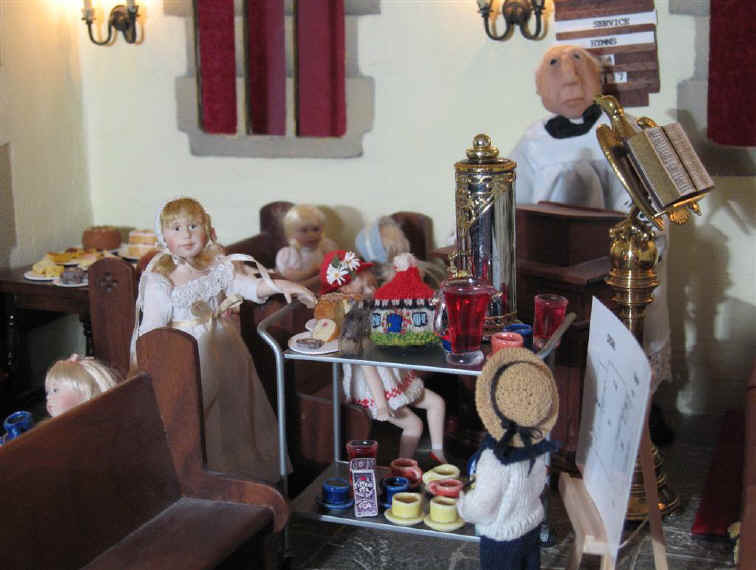 Alice has pushed the trolley down the church aisle to that everyone can come and help themselves to some cake and tea. The tea trolley has been specially made for us by John Cheal - thanks to John yet again for another work of art to add to St Hilary's! Thanks again to my sister, Catherine, for both knitting the cottage teacosie AND for making all of the cakes, pop and tea and coffee too!